The Hillsound Trail Crampon Pro combines some of the benefits of a traditional crampon with the comfort of a non-technical crampon. The Pro is ideal for someone seeking slightly more aggressive terrain. 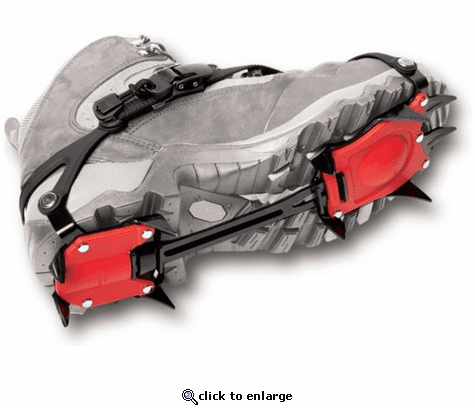 Utilizing simple ratchet buckle bindings, these crampons can be fastened effortlessly to most footwear. SAFETY INSPECTION: Before every use check over the product to ensure there is no damage such as loose buckles, tears, loose bolts, or warped or broken metal. If damage is discovered discontinue use to prevent further damage and potential injury. Test crampons prior to use for proper fit. Check positioning of front and rear spike plates on the outer sole of your footwear. Both front and rear plates must fit within the outer edge of your footwear when fitted properly. FASTENING & REMOVING CRAMPONS: Always put on and remove crampons while seated and in a flat clear area to avoid falling over while balancing. To fasten the product, place toe on front base plate so front spikes sit flush with the tip of boot. Wrap the x shaped straps around foot and pass through the ratchet buckle, tightening until you feel a snug fit and the crampon does not move on your shoe. Ensure the front and back steel base plates are sitting square under the forefoot and the middle of the heel respectively. To remove crampon first remove alpine stopper. Then pull up on front buckle tab and slide straps out of buckle system. And remove foot from crampon. If traveling in deep snow areas, slide the Alpine stoppers on the loose end of each strap until it sits flush against the buckle. Place one foot down at a time to test that it is fitting well and not moving. PROPER APPLICATION: Hillsound Trail Crampon PRO is designed for recreational activities, such as glacier travel and icy or snowy approaches, and is not made for technical climbing. These are not a mountaineering crampon. Avoid using crampons when on stairs or river crossings. Only use crampons in winter snow and ice conditions. Only stiff soled, full shank hiking or mountaineering boots should be used with the Trail Crampon Pro. If the sole can bend easily it is possible for the metal base plate adjoining bar to bend or break. This product has been tested to -50_C. Under temperatures colder than -50_C the polycarbonate buckles and metal can become brittle and break. Avoid contact with any chemicals as they may interfere with the integrity of the crampon. SAFE TRANSPORTATION: Transport crampons using a sturdy bag so as to protect the spikes from damaging personal belongings. Always position the spikes away from the body when transporting them. CARE & MAINTENANCE: After use crampons must be thoroughly cleaned, dried and stored in a cool dry place. The carbon steel base plate can rust. To prevent rust they can be oiled after use and drying. Topical rusting on carbon steel plates can be removed by scrubbing with metal brush. Oil the scrubbed surface if necessary.